Andrea Care, one of the most significant tenors of his generation, had his recent triumph at the Royal Theater in Madrid as Pinkerton in “Madame Butterfly” and as Don Jose in “Carmen”. Now he is preparing his debut at “Queen Sofia” Palace of Arts in Valencia, where he will be again in the costume of the protagonist of the opera “Don Carlos” by Verdi – a role which the Italian singer has already performed in Canada, France and the legendary Bolshoi Theater in Moscow. 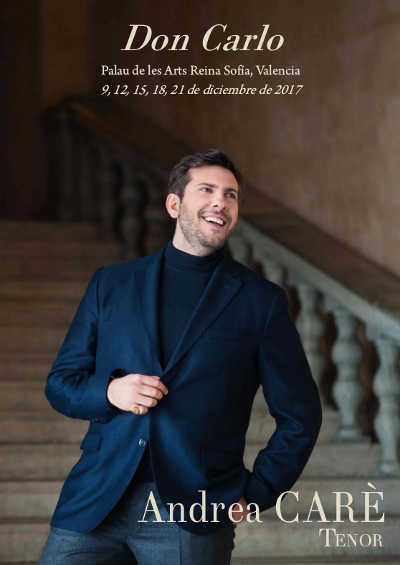 "This is a fascinating hero with sophisticated psychology and difficult one for interpretation and as vocal technique, but I believe that corresponds very well to my voice" - said the tenor who is excited to perform this opera in Spain, the country of the action. This time he will personify into Infanta next to Rodrigo performed by Plácido Domingo, with whom Andrea Care has already been on the stage several times and with whom he recorded “Nabucco” on DVD (Sony). Andrea Care - the winner of Spoleto International Opera Competition (2005), has improved his skills with the mythic soprano Raina Kabaivanska, and also with the legendary Luciano Pavarotti. He will make his debut in the forthcoming seasons in New York Metropolitan Opera and at Vienna State Opera after participating in performances at some of the most significant opera theaters in the world, as the Royal Theater in Covent Garden in London, Teatro Liceo in Barcelona, the Royal Theater in Turin, Rome Opera, Deutsche Oper in Berlin, the National Center for Performing Arts in Beijing and La Scala in Milan. This production in Valencia will strengthen Care’s presence in Spanish opera market after his debut in Barcelona and Madrid.